Oof! Got a laugh at my sanctimonious self last night. Feeling fine using my official lint safety tools to protect my family. Laundry flowing, getting things DONE after 2 extra snowdays filled the household with glee and wet snowgear. I tidy up, pick lint off my shirt - only to spy my shirt is backwards. For the past 16 hours. Ahh, those hasty mornings when my focus is 110% G-centered. I likely grabbed it out of the dryer and changed in the laundry room while finding socks for G that morning, listening carefully to G's morning dialogue, carrying misc. items which likely were forgotten, texting my teens, etc. Funniest part? The only one awake so late with me to share this goof with wouldn't get the full meaning. G would simply add it to the Mom-ism File. I know I've done better. I choose to laugh at the things which I cannot change. Acceptance? Daily, with zeal and passion. Should I start a new ASD awareness campaign? 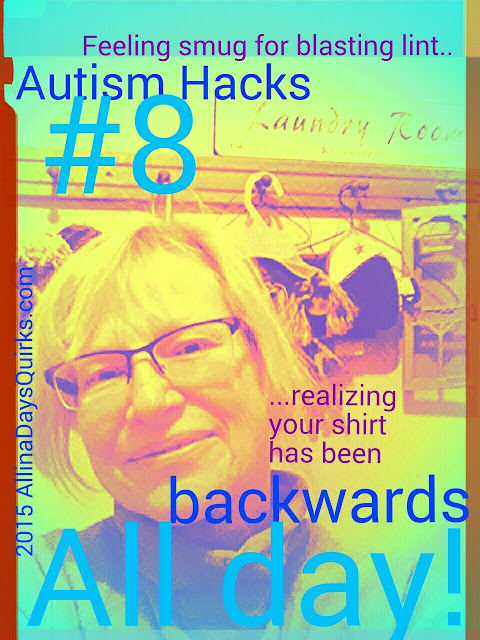 Forget ice buckets, ribbons, colors - show your flaws/hacks for ASD! Selfie bad hair day, spills, routine fails, etc. Share a giggle with yourself. Remember that you once had it together. Picture yourself on your most impressive day. Delight in the differences.